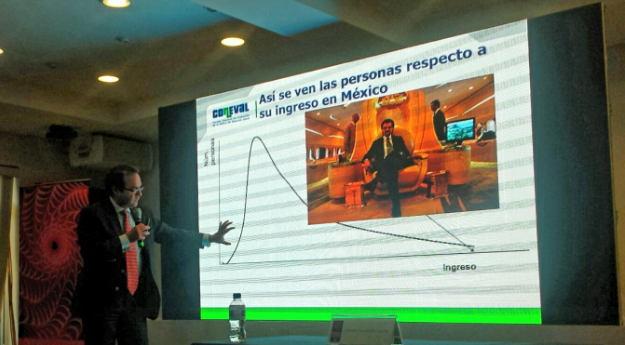 I’ve just spent several interesting days at the second science and humanities conference of the Mexican Academy of Sciences in Mexico City (link). My thanks to Dra. Rosario Esteinou, Chair of the Social Sciences Section of the Mexican Academy of Science, for inviting me to participate. This forum is a very interesting effort to bring together researchers across the spectrum of the sciences and humanities in useful dialog with each other. Biologists, physicists, biologists, astronomers, sociologists, and humanists from Mexican universities and institutes (along with a handful of international visitors) interacted intensively through a series of panels and plenary talks, with animated conversations taking place in the common areas throughout the days of the conference. Speaking for the Academy in the opening session, organizers set high and convincing expectations about the value of interdisciplinary and international collaboration. I attended sessions on nano-materials, plant evolutionary history, and economic development goals, and I found all the presentations to be of high quality and interest. And more significantly, I witnessed a real intellectual engagement by physicists, biologists, and social scientists around each of these topics. Particularly interesting for me was a session on well-being and development for poor and disadvantaged populations in Mexico. This season was chaired by René Millán and included presentations by Gonzalo Hernández Licona (Director of the National Council for the Assessment of Social Development Policies – CONEVAL), Rodolfo de la Torre (Director del Programa de Desarrollo Social con Equidad, CEEY), and Gerardo Leyva (Deputy Director General for Research of INEGI). Key themes included human development, the status of indigenous people, the situation of rural women, and the challenge of extending opportunities for all Mexicans. Speakers showed a real and committed involvement in the importance of poverty reform that really works in Mexico, with an emphasis on creating greater equity and opportunity for all Mexicans. Each speaker took Amartya Sen’s theory of capabilities and functioning as given; disagreements turned on how this basic theory might be supplemented to incorporate empirical studies of perceived well-being and how to create policies that worked to broaden social inclusiveness. 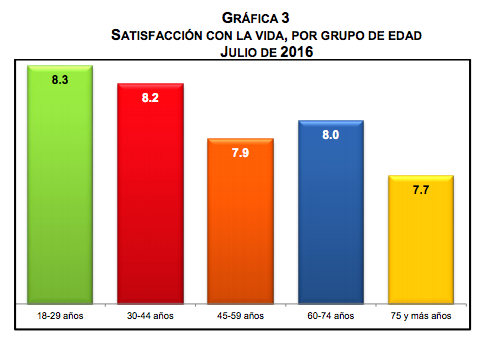 There are not large differences across age groups, but it is interesting to see that 18-29 year-olds report the highest level of satisfaction. In particular, it seems to suggest that young people have a favorable view of their futures in Mexico. Rural communities in general and indigenous groups in particular continue under increasing pressure. Their living conditions deteriorated as their production systems demanded more from the land; they produced crops for human consumption on their rainfed lands, developed handicrafts and other artisan products, and raised animals and horticultural products, including hogs, chickens, fruits and herbs, in their backyards. The most fortunate among them were able to protect their access to other natural resources, such as a lake or river for fishing and to meet their water needs and a forest for wood or hunting. Over the decades, they accumulated a rich experience in managing these resources, developing sophisticated management systems that were integrated gradually into their customary practices. They continued trading activities, among themselves and with others, maintaining and modifying their traditions, adapting them to changing conditions, strengthening their communities and their identity, choosing to protect their most cherished values and practices in each historical moment. Organizations like the New Rural Reconstruction Movement in China (link) and Via Campesina in many countries (link) came up in the conversation, and the two recent PhD students in this program described their economic ethnographic work in several Mexican indigenous agricultural communities. This work is interesting in part because it is aimed at crafting an alternative to both neo-liberal and classical leftist ideas of an economic future for the developing world. My overall impression is that the sciences are robust in Mexico today, and that there are energetic efforts underway to solve Mexico’s most pressing social problems.